Family vacations are "unforgettable" for a variety of reasons. Some family trips achieve that status because of their incredible destinations, while others are particularly memorable due to family celebrations or shared activities together. A few getaways manage to combine both of these, resulting in a vacation that strengthens family bonds and leaves everyone rejuvenated. Windjammer Landing is that type of place. Patterned after a picturesque Mediterranean village, Windjammer Landing's whitewashed buildings stand out against the lush green vegetation and blue Caribbean Sea. Located on the scenic island of St. Lucia, this 60-acre hillside property offers families a tantalizing combination of breathtaking ocean views, extensive activities, and great food. The suites and villas give families plenty of room to spread out, enjoy some private time, and even cook in if desired. Windjammer Landing is quite unique, as it offers luxurious villas and large homes with all of the amenities of a full-scale resort. This feature provides families with the best of all worlds and is particularly important when planning a family reunion or a multi-generational vacation. In addition, the resort truly caters to families with children of all ages – allowing every member of the family to enjoy the vacation they so richly deserve. In the space of a few short days, Windjammer Landing earned a special place in my heart. I've made Windjammer Landing's white sand beach and palm-covered tiki bar the home screen image on my BlackBerry. Just seeing that tropical setting always relaxes me and brings a smile to my face. It's a great spot for a family vacation. 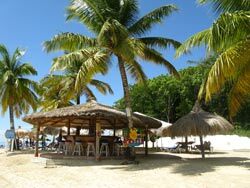 Windjammer Landing has a beautiful 1,500-foot crescent white sand beach with lots of palm trees and palapas for shade. The entry into the sea is very gradual and the waters of Labrelotte Bay are calm - perfect for young children. Because many of the resort's guests are timeshare owners, the beach at Windjammer Landing has a unique family feel. Many of the property owners have been coming here for years and know the property and staff well. They provide a nice sense of community as well as offer helpful insider tips for things to see and do while at the resort. The resort has five swimming pools including a large main pool with plenty of shade and lounge chairs. Chairs were always available around the main pool during the day. Some of the villas have their own plunge pools or full-size swimming pools as well. Windjammer's Jacquot Fun Club for ages 4-12 operates from a spacious and well-equipped facility and offers an extensive array of activities. Daytime activities include tours, a jeep safari, water sports, nature walks, snorkeling, beach Olympics, and cultural and craft activities. The Club's evening hours from 6:30 to 10 p.m. allow parents to have a romantic evening out while the kids enjoy parties such as pajama night, pirate night, and other themed evening events. Babysitting and nanny services are also available upon request. Teens aren't left out at Windjammer Landing. They are catered to with a host of daily teen-only activities including pool and beach volleyball, sunset cruises, beach games, waterskiing and tube rides, off-site trips and dance classes. The resort's Teen Club on the beach features a pool table and other games, giving teens a place to meet and socialize together. Evening events include teen get-togethers, excursions, and bonfires on the beach. Windjammer Landing's spacious suites and luxurious villa accommodations are particularly special for families, providing privacy and lots of room to spread out. The resort's hillside location provides guests with breathtaking Caribbean views and continual shuttle bus service offers easy transportation. All of the suites and the one- to four-bedroom villas have large private terraces or patios - perfect for watching nightly sunsets. All of the villas have fully equipped kitchens and complimentary Internet access is available. Multigenerational groups and families seeking the optimal indulgence should reserve one of the three- or four-bedroom Estate Villas, featuring full-size pools and the services of a dedicated chef. The resort's five restaurants will please a wide variety of palates. We particularly enjoyed the seafood at the Upper Deck and Mediterranean fare at Papa Don's. The views from this hilltop restaurant are lovely. Dragonfly, the resort's recently renovated signature restaurant, is a good choice for those who enjoy Asian cuisine. For a change of pace, outstanding restaurants in nearby Castries are just a short drive away. Windjammer Landing provides a wide variety of activities for its guests, including the full range of watersports, tennis, an air-conditioned fitness club, shopping, and golf at the nearby St. Lucia Golf & Country Club. An extensive list of tours is also available. Because of the resort's strong community ties, opportunities for voluntourism and giving back can be arranged by the helpful concierge staff. Both EP and All-Inclusive plans are available at Windjammer Landing. In addition, the resort offers a number of money-saving deals on its website, www.windjammer-landing.com. Make sure to check there before booking. Windjammer Landing is celebrating it 20th year anniversary in 2010, so there are a number of "20" oriented deals available. In addition, the resort offers Sun Dollars promotions which provides as much as $1400 per week in resort credits based on the type of accommodations reserved. See the resort's website for additional details on these promotions. Guests can be as relaxed or as busy as they wish at Windjammer Landing. The resort's lush, private setting is perfect for those seeking peaceful rejuvenation. It's easy to spend hours just chilling at the beach or by one's own private pool. But there's lots more fun waiting for those for those who want to sample all that this Caribbean island has to offer. Windjammer Landing has one of the most extensive watersports programs in the Caribbean. Scuba programs lead by PADI-certified diving instructors are available for beginners to highly experienced divers. A kids program and underwater photography classes are available as well. For those who would like to experience the feel of scuba diving without the hassles, the resort's SNUBA program fits the bill. SNUBA is a combination of snorkeling and scuba diving, allowing participants to descend up to 20 feet underwater while connected to an oxygen hose. No tanks or dive certifications are required. Guests feeling the "need for speed" will enjoy Windjammer Landing's motorized watersports activities including waterskiing, tubing, knee-boarding, wakeboarding and banana boat rides. These activities are included in the resort's all-inclusive plan and nominal fees apply for room-only guests. Families can also enjoy snorkeling, windsurfing, Hobie Cat and Aqua-fin sailing, kayaking and catamaran sailing. Windjammer Landing is also a great choice for golf and tennis enthusiasts. The resort's two Astroturf courts are floodlit for night play and complimentary tennis clinics and a tournament are offered. Tennis lessons from the resort's resident pro are available for an additional fee. Tee times for golfers can be arranged at the nearby St. Lucia Golf & Country Club, an 18-hole Par 71 championship course. The course offers panoramic views of both the Atlantic and the Caribbean and ocean breezes add to the challenge. Club rentals are available. Voluntourism activities are also popular with today's families. 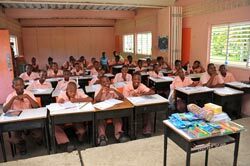 Windjammer Landing is active in the community, supporting the Grande Riviere Primary School in nearby Gros Islet and Faustin's Children's Home in Soufriere. One of my favorite activities here was bringing educational supplies to the primary school and visiting with the children. Windjammer Landing's staff members were key in setting up these programs and they accompanied us on our trip. We were warmly welcomed by the Acting Principal and the students, who read and sang songs for us. This is a wonderful initiative for families and provides a great way to give back while on vacation. It would be a shame to come to St. Lucia and not see the Pitons, waterfalls, and breathtaking scenery. There's also a wide variety of shopping available in the nearby cruise port of Castries. Car rentals are available onsite for families who want to explore the island at their leisure. Remember, however, that cars drive on the left-hand side here. Windjammer Landing also offers a wide variety of tours for those who want to leave the transportation worries to someone else. Families can cram lots of activities into their vacations at Windjammer Landing, but do take the time while you're here to relax and take stock of the world - and your place in it. It's easy to do when you're in a setting like this. In the late afternoon, as the day came to a close, we would gather to watch the sun melt into the sea. 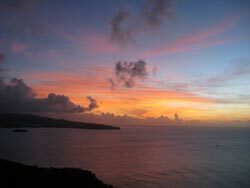 The sunsets with their blazing colors are particularly spectacular here, particularly when viewed from an eagle's perch high on the hillside. That's another picture that holds a space in my cell phone collage. For me, Windjammer Landing was simply unforgettable. I can easily understand why the resort has earned so many travel awards. All of its special features come together so beautifully - the lush setting, the friendly people, the luxurious accommodations, and the wide array of activities. This is a Caribbean family vacation spot that should not be missed. Windjammer Landing has a wide variety of studios and villas. Some are located at the base of the hill near the beach and restaurants, while others atop the hillside afford spectacular views. A shuttle bus runs throughout the resort. If your family prefers quick and easy access to most facilities, choose accommodations near the beach and main pool. For the most incredible views, however, choose a perch high up on the hill. Settings like those are hard to find. Talk with a Windjammer Landing reservationist to choose the accommodations that are best for you. St. Lucia is easily accessible from a many U.S. cities and a number of direct flights are available. JetBlue is now offering direct flights to St. Lucia from its New York hub at JFK airport. The airline offers a variety of free in-flight snacks and the new JFK terminal facility makes check-ins a breeze. My kids love JetBlue’s seatback TVs and 35 channels of free DirecTV programming. The first-run movies on our flight to St. Lucia were free. 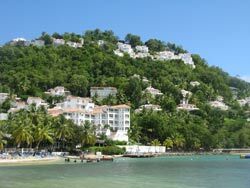 Do take an island tour or rent a car for at least one day while staying at Windjammer Landing. The island of St. Lucia has some of the most beautiful scenery in the Caribbean. Popular stops include Morne Fortune, Marigot Bay, the fishing villages of Anse La Raye and Canaries, the Piton overlooks, the Toraille Waterfall and Botanical Gardens, and the famous drive-in volcano in Soufriere. St. Lucia is a wonderful destination for collectors of native crafts. If you take a tour of the island, some of the best arts & crafts stops include Caribelle Batik, Eudovics Art Studio, Livity Arts & Crafts Centre and Choiseul Arts & Crafts Centre. Michelle Eliott of the Coal Pot Restaurant makes brightly colored hand painted pottery. It can be found at ClearBlue Stores or nearby at the Coal Pot in Castries - a superb choice for dining out. ©Copyright 2019. The Beacon Group, Inc. All Rights Reserved.